pewag snox is the only snow chain that is not mounted, but snoxed! s(nox)olution! 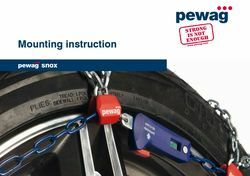 is the new chain’s slogan and brings it to the point: pewag snox makes the mounting of your snow chain easy and comfortable.